The Best Handbook for Learning to Speak Italian! Italian for Beginners - the perfect reference guide for traveling to Italy! You might be eager to learn the Italian language for a number of reasons. Maybe it's because you're planning to move to Italy or stay there for an extended vacation. You probably want to learn the language because it will be useful in your career. Or maybe you just love the way it sounds when Italians seem to let the beautiful words just flow smoothly. Whatever your reason may be, this book will be your handy companion. It has all the basic lessons you need to learn to begin your journey in becoming fluent in the Italian language. This book has been divided into 11 easy-to-digest chapters that have been organized to make the learning process so much easier than you would have thought possible. 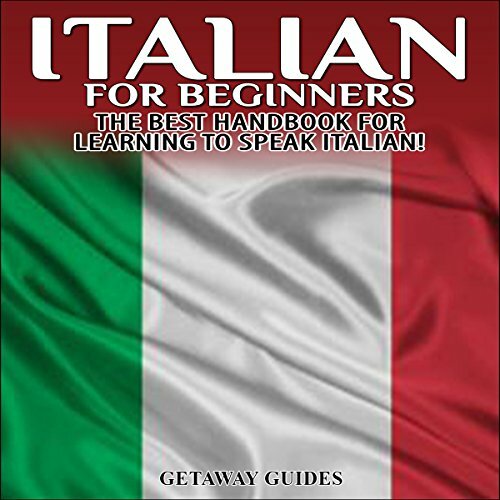 From the alphabet letters and their pronunciations to more complex grammar lessons like forming possessive adjectives and pluralizing nouns, this book will guide you through the basics of the language so that you'll be speaking like a true Italian in no time! Even if you slow this down, the narrator is not in tune with a true beginner. Impossible.